Barack Obama needs to get the United States out of the fighting in Yemen: A local power struggle could soon become sectarian. The civil war in Yemen is a messy power struggle that will likely get worse before it gets better. Houthis demonstrate against an arms embargo imposed by the U.N. Security Council on the group in Sanaa, Yemen, on April 16, 2015. There may be no messier spot on the planet than Yemen, and too many nations—Saudi Arabia, Egypt, the Gulf states, Iran, and the United States, too—are making it still messier by cramming it into the framework of the most divisive regional politics and then hoping, against all reason and history, that bombing its cities will settle its problems. The Saudi air force commenced bombing on March 25—and has since been joined by the United Arab Emirates, with the United States providing logistics and intelligence—in an attempt to oust Houthi rebels, who have taken over the Yemeni capital of Sana after ousting President Abed Rabbo Mansour Hadi. The Houthis are Shiite and have reportedly received some arms from Iran; Hadi is Sunni and thus was viewed as a “stabilizing” force—a bulwark against Iranian incursions—on Saudi Arabia’s southern border. But in fact, this framework distorts the true picture—it’s a Procrustean bed that chops off the root causes, and plausible ways out, of Yemen’s conflicts—and we should abandon our role as enabler as quickly as possible. President Obama seems to be doing just that, pressuring the Saudis to halt the bombing. They briefly complied, putting out the cover story that they’d accomplished their military objectives—but soon after resumed the airstrikes. The Saudi ambassador to Washington said on Wednesday that his country would continue to stop Houthi advances in Yemen, but this suggests that the Houthis are alien invaders. In fact, they are, and have been for centuries, the dominant tribe of northern Yemen, which was an independent state until 1990, when it merged with southern Yemen to form the Republic of Yemen. The north had been, and still was, predominantly Shiite (mainly Houthi); the south was, and is, predominantly Sunni. And after unification, the southern Sunnis ruled, marginalizing the northern Shiites—thus almost inevitably siring revolt, especially since Yemen, the poorest of all the Arab countries, has few resources to share in the first place. The Houthis have received some arms from Iran in recent years, though they’ve captured more from local armies and militias. In any case, the source doesn’t always determine loyalty. Throughout history, as Asher Orkaby notes in another Foreign Affairs article, they’ve taken arms from anyone, anywhere, out of undisguised, opportunistic self-interest. In the mid-1960s, when they were waging guerrilla war against Yemen’s government, they received a bounty of arms—14 airdrops’ worth—from Israel, which viewed the Houthis as proxies for its war against Egypt. They’ve also, at various times, taken arms from the United Kingdom, Jordan, and even, in a particularly baroque confluence of interests, Saudi Arabia. From the Houthis’ standpoint, the fight—a continuation of battles going on for decades—is not sectarian by nature, but it could become sectarian if their allies and enemies see it that way and if adopting that view might boost their chances of winning. So, if Saudi Arabia keeps bombing because it sees Houthis as Iranian agents, and if Iran speaks up on the Houthis’ behalf (its special forces commander, Maj. Gen. Qassem Soleimani, hailed the Houthi coup as another gold star for the spread of Iran’s influence), then the war is more likely to turn sectarian with each spiral of escalation. 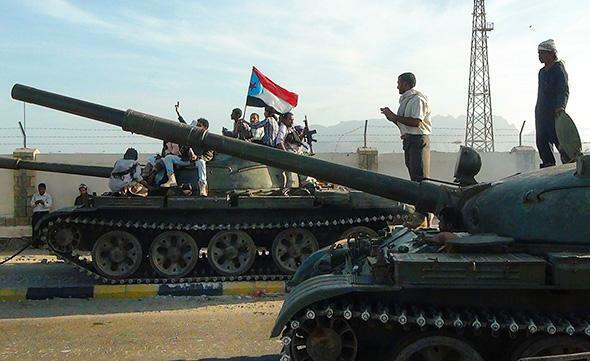 Yemeni militiamen loyal to President Hadi sit on tanks, one flying the separatist Southern Movement flag, in Aden, Yemen, on March 19, 2015. It’s all too reminiscent of the more petty and tragic “proxy wars” of Cold War times, when Washington tried to crush every third-world movement that mouthed communist slogans or received aid from Moscow—and bolstered every monstrous regime that mouthed anti-communist slogans and was happy to get aid from Washington. In this sense, the Saudis regard Yemen as the proxy in its nascent war with Iran, and the Yemeni people aren’t likely to emerge for the better. Nor, ironically, is Saudi security. 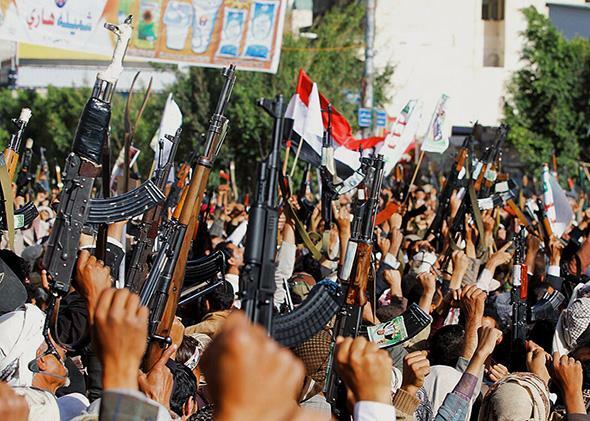 The Houthis are excellent, disciplined fighters who have mustered the most potent armed resistance to al-Qaida. If the Saudis are worried about stability on their southern border, al-Qaida poses a much bigger threat than the Houthis. Yet by trying to crush the Houthis, out of knee-jerk paranoia over their alignment with Iran, the Saudis risk creating a vacuum, which the bigger, more expansive threat could occupy. As with many analogues of Cold War times, the civil war in Yemen is driven mainly by political resentments and economic privation: It is, above all, a local struggle for power. The war will end, if it ends at all, with a political solution—which, in this case, means giving the Houthis some power-sharing role in northern Yemen. Yet the Saudi airstrikes, combined with a blockade of food and other supplies, will only deepen the resentments, stiffen the resistance, and prolong the war. To the extent that Iran takes advantage of the chaos (and chaos provides many openings), it will also have the effect of extending Iran’s influence, rather than curtailing it, and turning a local feud into an active theater of a regional war. President Obama should try to convince the Saudis to reverse their course—and, if that doesn’t work, he needs to get out.